23-year-old man was on finasteride for over year to control DHT prior to his consultation. He was facing diffuse pattern hair thinning all over his head, with frontal hairline and temporal recession. 4 months after one Hair Regeneration treatment, his frontal hairline had thicker hair growth, and his temporal areas increases their hair density. An overview of the top of his scalp shows thicker, healthier hair growth throughout. He also stated that the texture of his hair felt healthier soon after treatment. 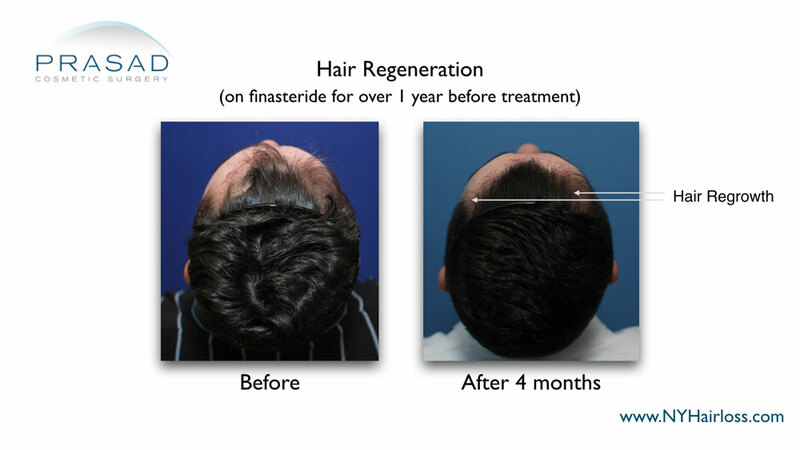 Even with the slowdown of hair thinning with finasteride, the Hair Regeneration treatment can stimulate thicker hair growth, and achieve new hair growth where hair has stopped growing. This case shows the potential synergistic benefit of combining finasteride and Hair Regeneration, especially among younger patients with high DHT-sensitivity. 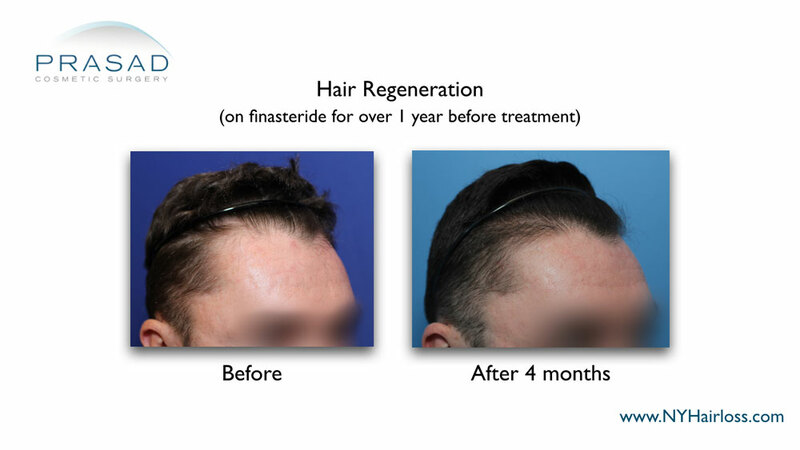 It also shows the mechanism of Hair Regeneration that stimulates thicker hair growth, and hair growth in areas that were not growing while on finasteride for over a year. This shows that the effects of Hair Regeneration on hair growth are entirely separate from a DHT-blocker that slows hair thinning. Hair texture and density can be improved with the Hair Regeneration treatment, especially for patients already on finasteride who still want more coverage.